iiyama belongs to the leading international vendors of monitors and displays both with and without touchscreens. The Japanese company drives its innovation ahead on the basis of more than 40 years of experience, focusing primarily on the development of powerful touchscreens and touchscreen technologies. At Jarltech you receive the complete range of iiyama touchmonitors: models for the desktop, for mounting and for use as interactive advertising and ad space in stores, businesses and public institutions. For each target group and application you will find the suitable model within the extensive product portfolio. Several powerful touch technologies, screen sizes ranging from 15 to 98 inches and a comprehensive service promise convince from the very first moment. More than 1,000 employees worldwide currently work on the iiyama success story. One of the main focuses of the company is on the readily attractive price - performance ratio. True to the motto »value for money« the key features for both the desktop models as well as the large-format (interactive) digital signage monitors are high reliability, top-quality components for superb image quality and precise touch handling. The service offering makes the decision for choosing iiyama easy. You can expect a two-year manufacturer's warranty, which may be extended free of charge to three years via a simple online registration. The warranty additionally includes attractive service for the entire timeframe. Depending on the product category and country you benefit from the iiyama professional replacement and repair services. 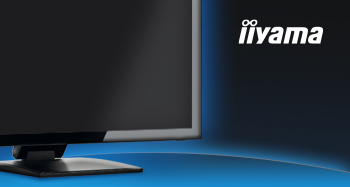 Another advantage for you: all iiyama monitors are designed for easy Plug & Play. That means that after unpacking nothing stands in the way of installation, because all relevant data are stored directly in the monitor and are automatically transferred to the operating system. This saves you both time and service personnel. Even power and connection cables are included, in most cases, with the delivery.